I was not very happy with my winter wardrobe last year so have been spending my sewing time trying to add pieces, that I love, that are warm and suit my lifestyle. This latest piece is a winner on all those fronts. I have made the collared version of the Paprika Patterns Jasper Sweater before for the Pattern Review sweater knit contest (review here). 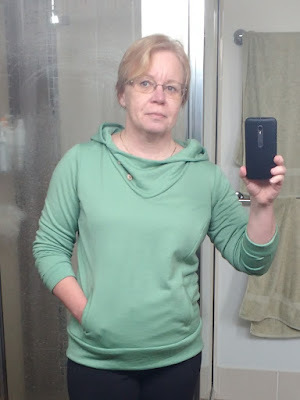 This pattern is not really intended for a sweater knit and it did work but I must say, making it in a fabric more suited to the pattern has had much more success... who would have guessed?! 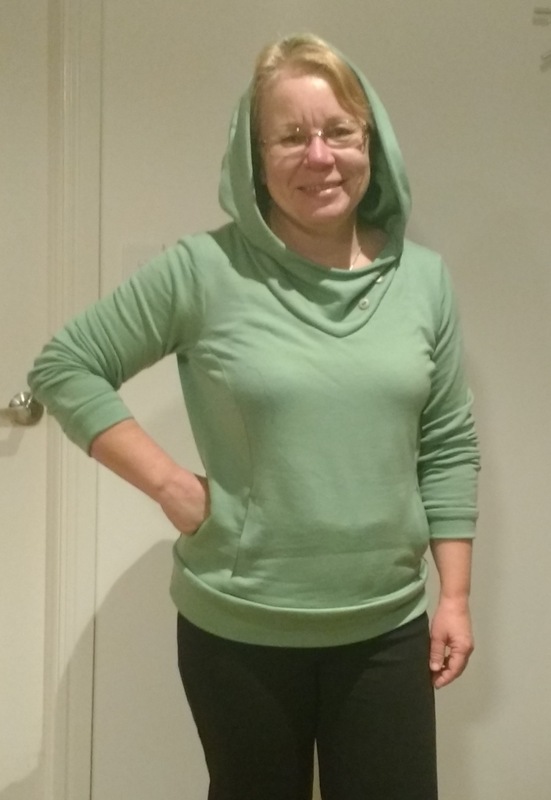 The fabric is a french terry knit which has merino in it bought from The Fabric Store last winter. Looking in the online store, they seem to call it loop backed sweatshirting. I did find a fault in the fabric when I was preparing it but had heaps of fabric so it wasn't an issue. I think when I bought it it was noticed and they gave me extra, as I don't think I would have bought such a long length as I had. I made the version with the hoodie as I am really loving hoodies in this cold weather and starting to really understand their attraction. This time I left the body length as per the pattern and shortened the sleeves by about 1/2 an inch. The only other change I made was to line the hood. I tried the suggestion in the pattern to overlock the seams and top stitch, but my overlocking thread is a green darker than the fabric colour and I didn't think it looked neat. Luckily I had plenty of fabric to cut two more hood pieces. 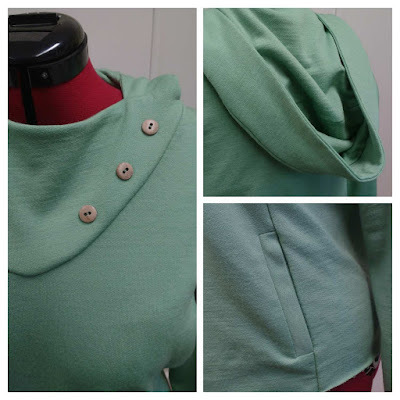 I inserted the lining by hand which gave a neat finish to the hood and covered all the visible seams. There is probably a way to do it by machine, but this worked so all good. I also hand picked a few spots along the hood seam in the ditch to hold the inner and outer hood together. 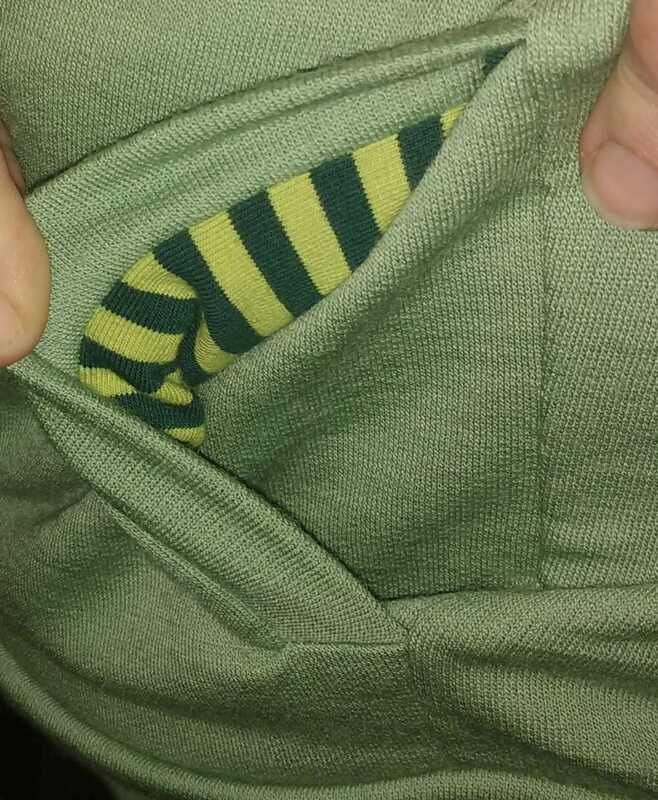 I used another cute striped fabric for the pocket lining as I love little hidden contrasts. This fabric is from Crafty Mamas and is great quality. I made this top from it in 2014 and it is wearing really well. Well I haven't taken this sweater off since I finished it. Total love and think I have hit the trifecta... pattern- fabric- colour that all works for me. Ciao kittens - I hope those of you living through this bitter winter weather are keeping warm! What a wonderfully cozy sweater! Great sweater. Love the colour and the details. I know I am late commenting, Sue, but beautiful work as always. A great hoodie! I'm even later and catching up. 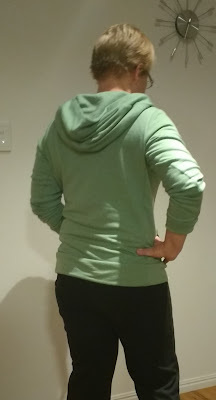 Lovely looking hoodie and the colour is so pretty, love the pocket lining.